Puzzles games. Doesn’t that conjure up images of matching, memorizing, and clearing blocks? That’s what usually comes to mind when I think of puzzle games. And there are tons of those in the iTunes store. Many of them are even free. Once in awhile, a really good puzzle game comes around that just shines. Trapmaster: Dragon’s Treasure from Leader’s Association is a nothing like ye puzzle games of old. It’s a new action puzzle game that will fire up your spirits. In the game, you’ll play as an old, mustached general named Raymond Jean who is on a mission to collect treasures from a dragon’s cave. 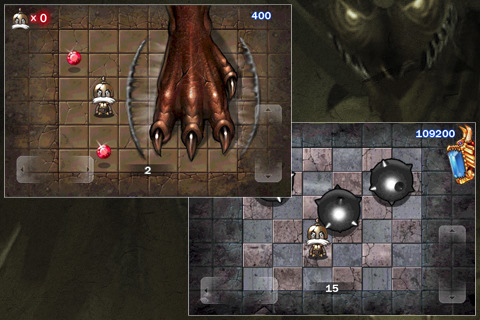 The dragon’s cave really looks like a 6 by 6 square battlefield on your iPhone or iPod Touch screen. Your goal will be to collect as many treasures that appear as possible, all the while dodging different obstacles like firestreams and boulders. If you miss too many treasures, the dragon attack gauge will lower. If the attack gauge is empty, the dragon’s foot will stomp you. Last as long as you can with the 3 lives you start off with. Controls are easy and the game is really straightforward: you’ll move in an up-down and/or left-right fashion. Customize your d-pad from the 5 different options: each option has different orientations and positioning for the d-pad on your screen. There’s also support for the game in English, Japanese, and Korean. If you don’t know how to play, there’s even a freeze frame of the gameboard with the different parts marked and described. The d-pad is surprisingly very responsive so you’ll be able to make last minute dodges once you become used to the gameboard. And if you need to pause your game, simply tap the middle of the screen. This was an excellent touch on the developers’ part because valuable screen space is not wasted. Trapmaster also has very appealing audio and graphics. The soundtrack sounds like battle music and really fires you up for your treasure collecting. The sounds that are made when you make selections and pause are also a nice touch. And I absolutely love the sound obstacles make when they are released and when the dragon gauge is lowered. It sounds exactly like a drawbridge! Graphics also make this one sweet app worth the money. The app is visually appealing with its colorful, detailed cartoonish characters. The animation on the general makes for hilarious fun. I just love how he looks when a boulder smacks him in the face or when he gets burnt to a crisp. I have very few gripes about this game. One thing that may be changed is to remove the 4 second silence following the music loop that plays on the start page. Secondly, I’d like a more detailed description of the goals and levels of the game. I’ll be honest with you: I haven’t been able to last past Level 1-3. If there are those who are struggling like I am, a preview would give us something to look forward to and strive towards. Thirdly, it would be great if there are additional levels and obstacles or treasures with future updates. Overall, this is one fantastic puzzle app for the wee ones, those with hair as white as the general’s mustache, and everyone in between. The app’s integration with OpenFeint means achievements are available to unlock, and the leaderboards will keep you playing until you can get a high enough score to place. Trapmaster: Dragon’s Treasure is a jewel of an app and well worth the $0.99. AppSafari review of Trap Master: Dragon’s Treasure was written by Linda Ta on May 12th, 2010 and categorized under Action, App Store, Asia, Fun, Games, Puzzler, Strategy. Page viewed 5040 times, 2 so far today. Need help on using these apps? Please read the Help Page.